Road Trail Run: Altra Running Timp Review: Mountain Flippers! Altra Running Timp Review: Mountain Flippers! 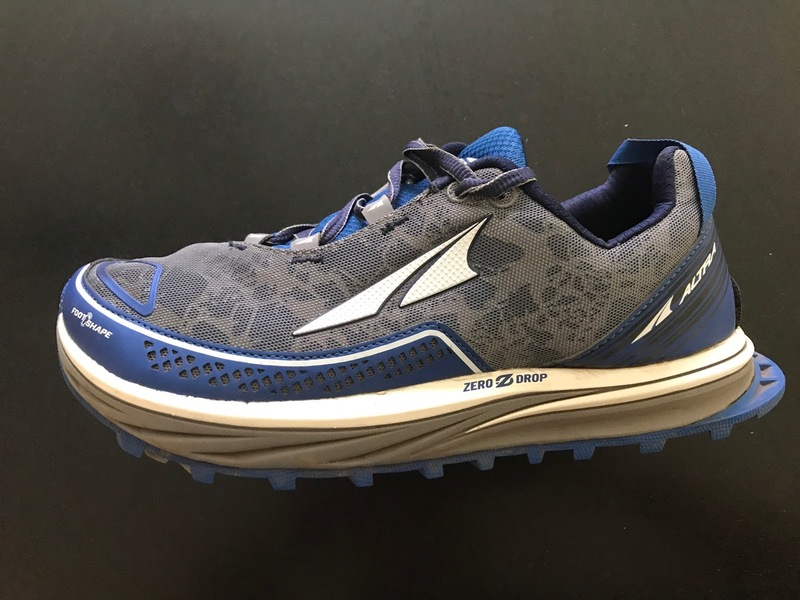 Altra Running Timp ($130) is a new near maximal cushioned trail runner sitting between the Altra Lone Peak (25mm stack) and Olympus (36mm stack). According to Running Warehouse it weighs a hefty 11.4 oz. M9, 9.4 oz./266g W9. My US 8.5 weighs 11.2 oz. Timp has Ultra's signature Zero Drop platform with with a 29mm heel, 29mm forefoot stack. Of course the toe area is Foot Shaped and is broader and higher volume than its Lone Peak cousin. As with all Altra trail shoes it is named after a Utah peak. 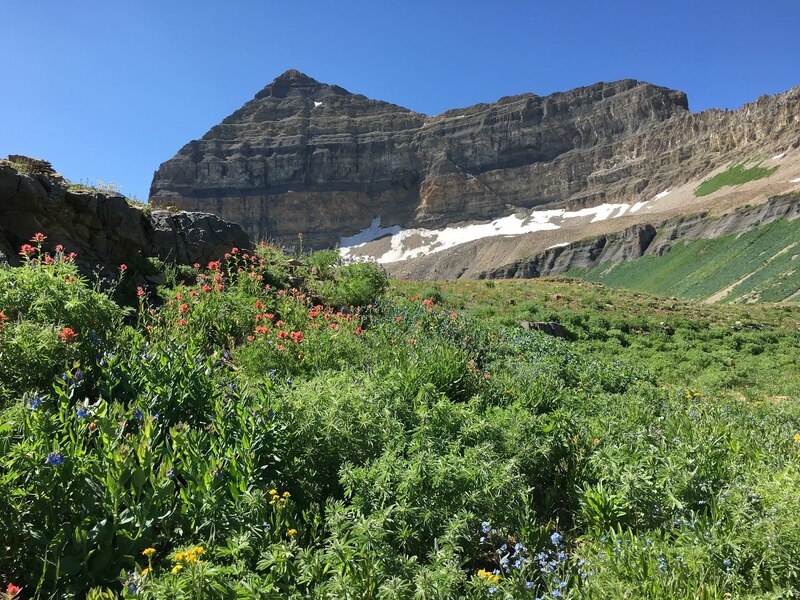 In this case the iconic Timpanogos a magnificent summit with wildflower meadows below its very long cliff band. Aptly named, the Timp is the perfect shoe for the 12 or so mile round trip of mostly smoother single track followed by a steep scramble to the summit. I titled this review "Mountain Flippers". The Timp has a very wide toe box and platform on the trail. The fit is true to size but narrow feet may swim. The flipper part is more than just a comment on its looks. There is a distinct sensation while climbing in these surprisingly flexible shoes with a wide platform that they act much like swim flippers in water as there is tons of ground contact area to push off with fully deployed toes! The upper has a very dense outer protective mesh and a thin inner layer. Other than a thin frame overlay over the toes and the logos the upper is largely unstructured above the sewn on lower overlays and toe bumper. The sewn on overlays are thick and very decently pliable, also assisting flexibility due to the many holes punched into them. It remains to be seen given the relatively unstructured rest of the upper how durable the Timp upper will be at the flex points, but given the good pliablity match between upper and overlays we hope decent. Breathability is more than adequate and with the holes in the lower overlays drainage should be good too although we have not run in wet conditions yet in them. The gray patterning on the inner layer, which we think looks cool, is reflective with the Timp having 360 degree reflective protection as seen below when flash photographed. The lacing is asymmetrical turning towards the medial side. We found this approach highly effective in Altra's similar lasted Torin 2.5 road shoe. It really makes such a broad and deep toe box surprisingly well held. The tongue is quite short, lighted padded and could be more substantial in stiffness. 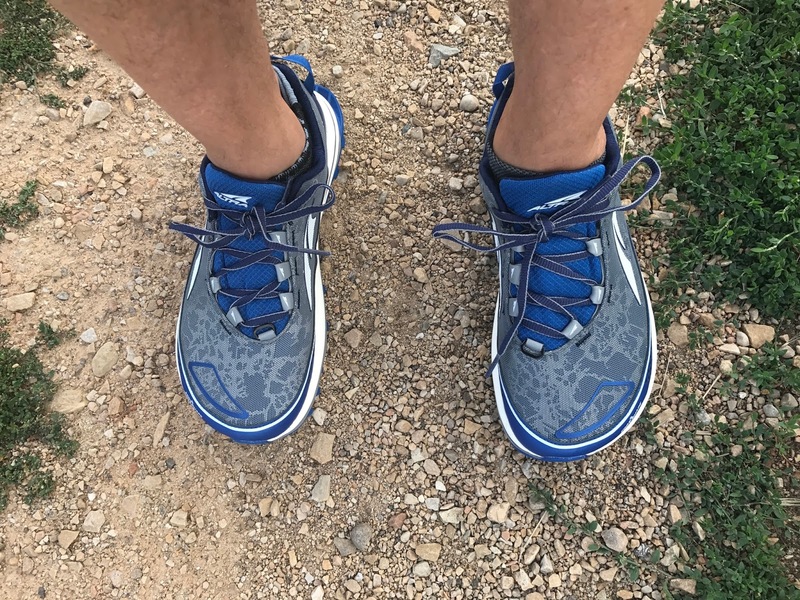 Perplexingly towards the heel and in the same fashion as the Lone Peak 3.0 and unlike the trail worthy Torin 2.5 road shoe things start to go South. The heel collar is low and lightly padded, providing less than ideal side to side heel hold on off camber or steep downhill terrain. Not a show stopper but could be better. We say perplexingly as the Torin road shoe has not only a more padded tongue but a higher collar (see above) but a more substantial padded heel collar and tongue (see below) and even includes a strap running further forward. as many trail shoe do most notably the excellently held Merrell Agility Peak Flex. 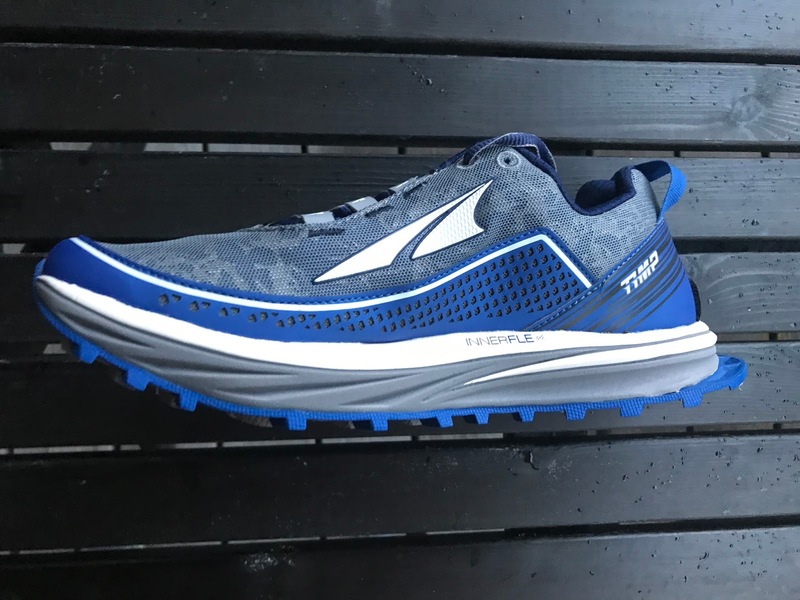 The rear of the Timp has a Gaiter Trap with a ring at the front of the laces as well as Altra's outrigger sole which we think mitigates and smoothers hard heel landings with the Zero Drop platform. 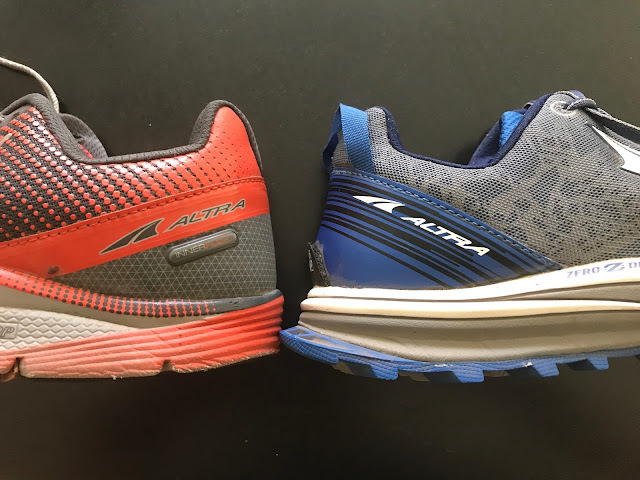 The midsole follows Altra's customary formula of a layer of Abound, the white layer below the foot, a bouncy compound then Altra's EVA. 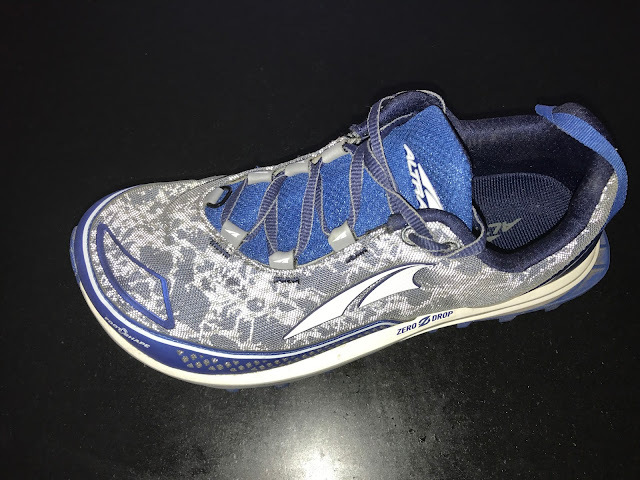 Here the gray EVA layer is quite soft and while the whole package is energetic and lively despite the shoe weight I would prefer it a touch firmer. 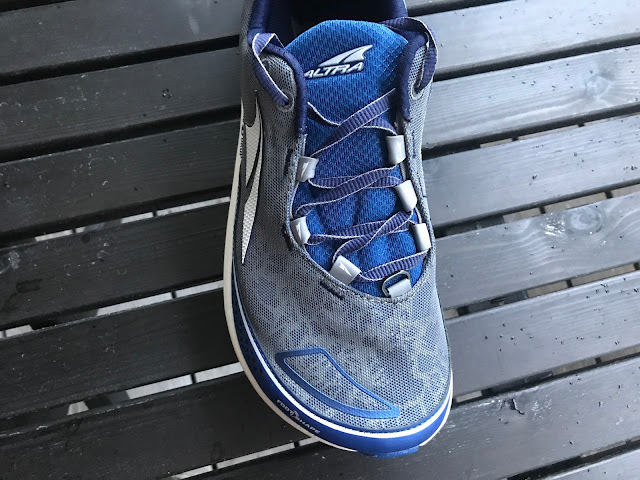 Within the midsole is Inner Flex described by Altra founder Golden Harper as much like a tennis racket's strings, a pattern of grooves in a grid helps increase flexibility and decrease weight. Not sure how much weight Inner Flex saved here but for such a big forefoot stack at 29mm the Timp is certainly far more flexible than any comparable Hoka. This flexibility plus the wide platform surely is why these "flippers" climb so well. There is no rock protection that I am aware of and I think not needed given the 29mm forefoot stack. 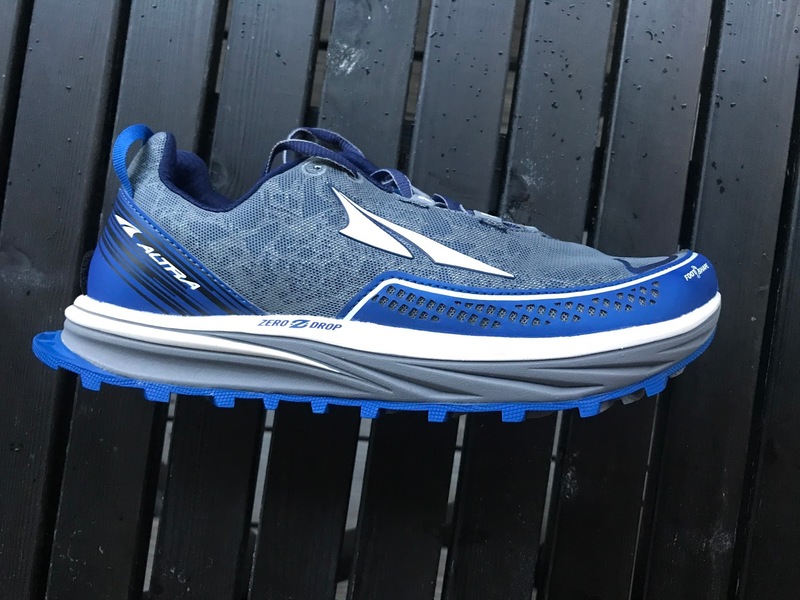 The outsole is Altra's MaxTrac with from what I can tell as consistent firmness in all areas. The lugs are a reasonable 4mm high. Again to assist in flexibility and save weight, we see a cut out to the midsole just back of the denser array of lugs behind the forefoot as well as a flex groove further forward. Durability has been good to date with the only noticeable wear on front edge of the 5 lugs just behind the flex groove, not surprising as these are the lugs which really dig in on uphills. This is one fun ride, especially climbing. I bombed my local New Hampshire 5 mile test single track loop with many turns, quite a few roots and rocks and sharp climbs with ease but I was a touch less confident on the descents as I would have been in some other shoes. They were yet better on the smoother single track in Park City. All that front flexible and stable surface area on the trail has me smiling in a way I really haven't experienced in a trail shoe since the very first Hoka Mafate where it was the tons of cushion that was the revelation. While the weight is up there at 11.4 oz., the Timp rides lighter than its weight. The cushion is maybe a touch soft but the comfort is outstanding. The heel upper hold could use some work as stated above. I was not as confident with downhill rear of the shoe upper hold on more technical terrain as I should have been as a result. Not a big issue, but I was forced to lace lock for the first time in many years and in many many shoes to hold things together. The lace lock was for a change actually comfortable and was helpful. Altra has come up with a shoe that balances comfort, cushion, and performance and that is fun to bomb along in. Climbing is particularly satisfying with the wide yet cushioned and flexible on the ground platform. The Timp is a great choice for smoother terrain Ultras and as an every day trail trainer at moderate paces and this despite its 11.4 oz. weight. Climbing performance is outstanding, rock protection more than adequate. It is a great choice for those seeking lots of "room" and volume in their shoes and not for those with narrow low volume feet, all that room and the low and relatively unstructured heel collar and upper may make them a little trickier to handle on more technical terrain. While the underfoot ride is similar in its softness, the Timp is less bouncy, a good thing as I don't find the underfoot ride of the SpeedGoat that stable at speed. The SpeedGoat upper is snugger and more secure overall and it weight almost 2 oz. less. I prefer the flexibility up front of the Timp, the extra room, less bounciness and the super fun ride especially climbing but those 2 oz are a lot to consider given the overall stack heights are so similar. The Lone Peak has a narrower fit and on the ground front platform. It suffers from the same heel hold issues as the Timp. Some of hold issue may have been resolved with the Long Peak 3.5 (Dom's RTR review here). 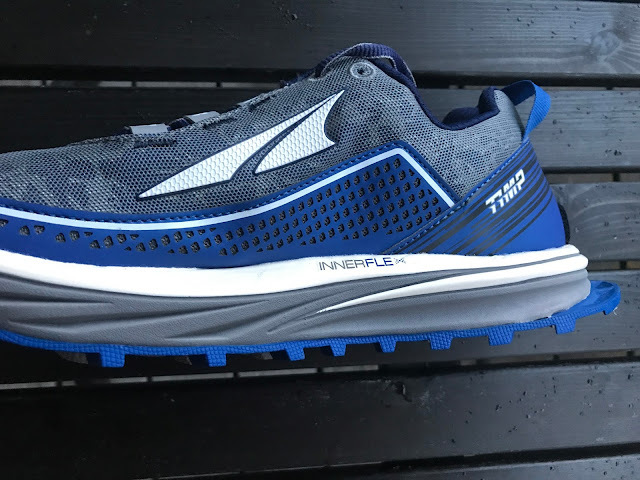 While Lone Peak weighs less and if I had one Altra to pick I would go for the long haul comfort and fun ride of the Timp as there are many other better options in a lighter class of shoe. No real contest here. While missing the MaxTrac outsole and a few millimeters of stack, helpful as not as soft and lighter, The Torin is equally roomy if snugger and has a better foot hold. Put some lugs on the Torin 2.5 and it would a perfect trail shoe for me. Again as with Speedgoat here we are looking at almost as much cushion stack in a lighter by 1 oz. package. Stiffer and with a snugger and not as comfortable an upper the Pro Max is a good choice for road and trail versatility but the Timp is just more fun despite the weight. Checking in close to the Timp's weight, the Agility has the heel stability and hold part locked in far better than the Timp. It is decently flexible and equally if somewhat more firmly cushioned . It would be my choice for more technical terrain over the Timp. For more mellow terrain and for a softer more energetic ride the Timp. The Altra Timp was provided at no cost. The opinions herein are entirely the author's. HOW IS THE TOEBOX WIDTH IN COMPARISON TO THE PARADIGM 3.0? I have not run the Paradigm. The Timp has not only a very voluminous and well held toe box and the upper materials are soft and overlay free. Have you seen or heard anything about an update to this shoe for 2018. I have not heard but I believe news of any updates will come at Outdoor Retailer in late July. I will be there and reporting! adidas Aero Bounce Review: Bar Bouncers?